I feel I owe a small explanation for the lull in the new article publishing on the site. I have remained active at responding to article comments, but I haven’t published a new article in nearly a month (although I just added some details to the latest article on BO XI 3.1 Fix Packs). Anyway, I have been busy on BusinessObjectsTips.com topics, this is sure! 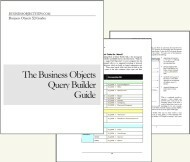 I have been working on a big update to our popular Query Builder guide. As many of us have discussed through email, I have been updating the guide, originally written based on BO XI R2, to include all of BO XI 3.1 new functionality. All of the XI R2 functionality still works perfectly in XI 3.1, but XI 3.1 brings some exciting new stuff like “Path Queries” and “Relationship Functions”. Writing and testing out examples always takes more time than I estimate, as also does my day job and personal life 🙂 . I hope to finish and publish it, the new guide version, not my personal life, by the end of this month. Of course, as always you can find the guide here (link) and as always this new version will be made available freely to all previous Query Builder customers. OK, back to work now. Thanks for your patience. Thanks for all that you do. Keep up the good work!